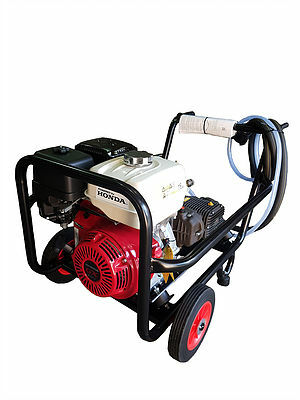 Honda Gx390 oil alert as standard, 3000 Psi 21 l/min Comet pump. Uploader valve fitter with external by pass. 2 mm tubular frame in trolley style frame powder coated, rubber tyres solid inner hub 250 mm x 25 mm axle. Lance & 9 m 2 wire hose as standart, water and chemical pick up hose complete with filter. Engine type air cooled 4 storke OHV petrol engine, 25° inclined cylinder, horizontal shaft. Max Power Output 13 HP / 3600 R.P.M., starting system Recoil(Electric start optional). Flow rate up to 21 l/min. Fuel tank capacity 6,5 l, pressure up to 200 bar 3000 Psi. Gearbox Ws151 with 1″ straight shaft, reduction rate 1 to 2.4 reduction.